ROOTCON Black card was formerly known as ROOTCON Ambassadors card, the black card is a program created by ROOTCON for the attendees to enjoy yearly discounts and other perks. 1. 20% discount on ROOTCON tickets applicable only on regular rates. 2. 10% off on all official ROOTCON swags. 3. FREE Entrance on ROOTCON Hackerspace activities. 4. FREE drinks at the ROOTCON chill-out area on the day of the event. 5. Priority lane during ROOTCON event check-in. 3. Only the card holder is entitled to avail the perks of the ROOTCON Blackcard. 4. ROOTCON reserves the right to revoke the RC Blackcard card if misused by card holder. 5. 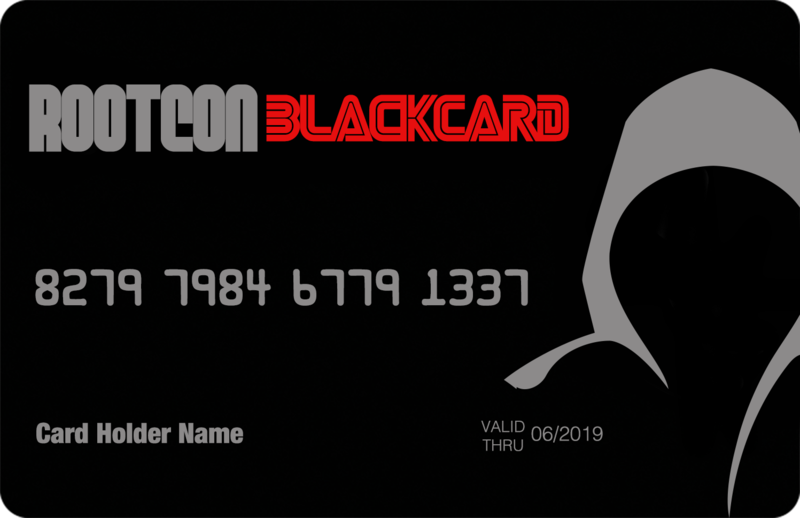 ROOTCON Blackcard card should be presented on the day of the event prior to check-in. 6. ROOTCON Blackcard card should be presented prior to purchasing ROOTCON swags or availing free drinks at the chill-out area.